Another Friday and another Anything Goes challenge at QKR Stampede. As always, we also offer you an optional twist on the theme if you want to use it and this week the twist is "Up, up and Away." 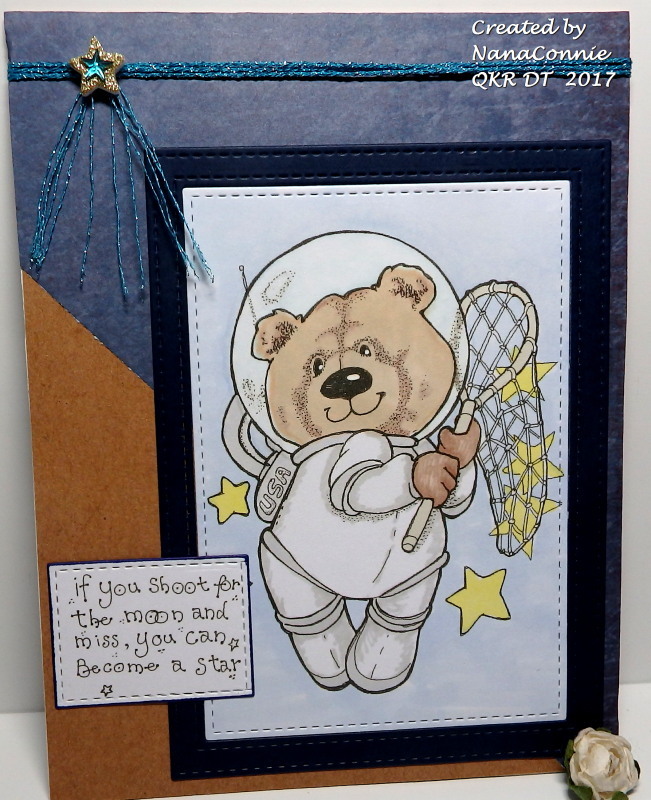 I chose this cute QKR image called "Star Catcher" and a QKR sentiment called "Shoot for the Moon." 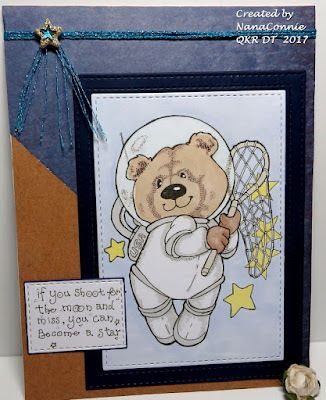 I colored with ProMarkers (astronaut) and chalks (sky and stars), then cut the image with a stitched rectangle die by Die-namics. 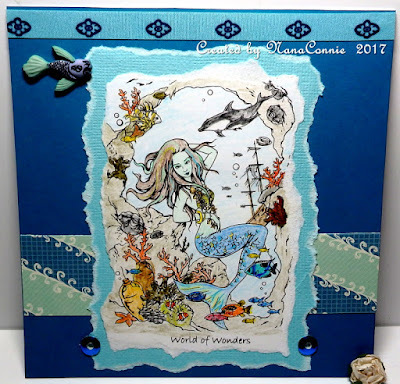 The frame is cut from dark blue CS with another stitched die from that same set. I used a kraft card base and a scrap of dp which has text on it but the text is very hard to see. I added glittery twine and a sparkly gold star to which I added a blue gemstone star. I thought that amount of sparkle was OK on an otherwise cute but sort of masculine card. Or maybe it's just that it's so CAS. 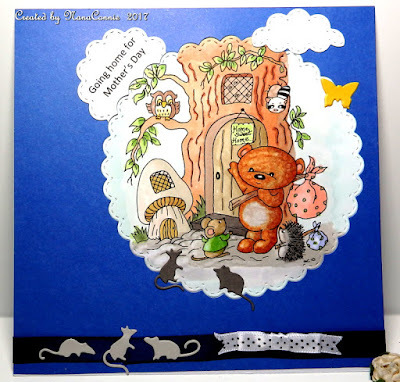 One more Mother's Day card, this time with a whole scene and lots of texture. 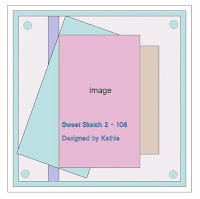 :-D I adore images from Di's Digi Designs and have been slowly collecting them. This is yet another image from them and I'm entering the card in their challenge. Isn't that just the sweetest bear? I love all his little forest friends, too. 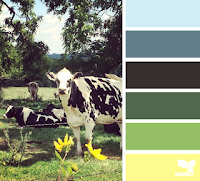 I took most of the colors from Catch the Bug's color challenge. I colored the image with my ProMarkers, and cut it with a stitched die from Memory Box. I do love my ProMarkers, and for all of my practicing with pencils, chalks, and other media, I love the way alcohol markers flow and blend. They just do that better than anything else I've found. The sentiment was also cut with a smaller die from that same set, as was the cloud. I die cut several tiny mice in two different colors, cutting them from heavy CS, which added to the texture on the card. I used two different ribbons which I found in my stash, one deep Navy blue and one polka dot for the bow. Again, more texture! The tiny butterfly was saved in my stash and, off the top of my head, I don't remember who made that die but I think it's from Presscut. I have such fun playing along in the Progressive Challenges at Limited Runs (their Facebook page) and the most recent image from there has me smiling from ear to ear. I decided that it should be used on an Easter card. What do you think? 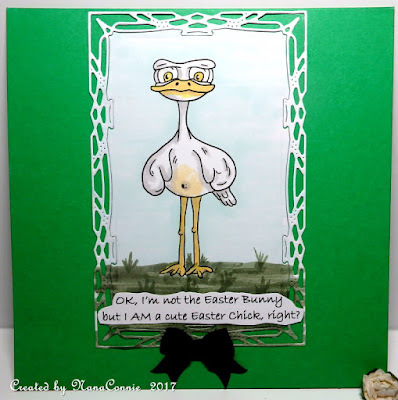 I colored the silly emu, named Elmo, and his background with ProMarkers then used a die from Cheery Lynn to cut both the image and the frame. I mounted them onto a green card base and added the sentiment. I knew I wanted this card to be CAS so the only embellishment I added was the little black bow. The unicorn image is from Dragon's Lair Designs and, once again, I colored with polychromos pencils. If I keep practicing with them, I might actually get good. I did add a few glittery stars to the sky with a sparkle gel pen but they just don't show in the photo. 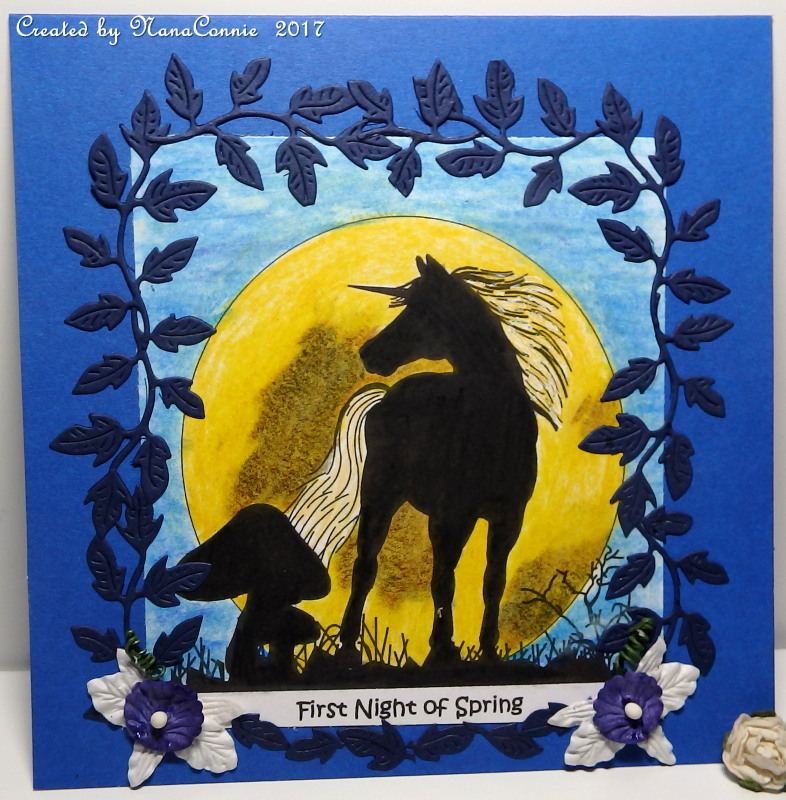 After coloring, I cut the image with a plain square die (QuicKutz) and mounted it in the center of a larger blue CS square, which I put on the front of the card base. 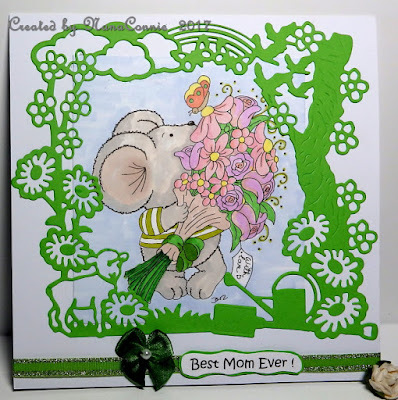 All the leaves were cut from scrap CS with a die from Cheery Lynn and they are embossed, giving the card some great texture. The orchid flowers were in my stash. I have no idea how long I've had them but I don't think I've ever used them so it definitely was time. They, too, added texture. I've been working on Easter cards since it does arrive in April this year and I want to make sure I have enough done to get them in the mail on time. Here's another one for today's post, using a stamp from Angie's Digital Stamps. Doesn't he look like he hatched out just in time to be an Easter chick? I used the sketch from Crafter's Cafe. The image is colored with a combination of polychromos pencils and ProMarkers, and I cut it with stitched circle dies from Die-namics. The dp for the background strips all came from scraps and I matted them with dark green CS. The flowers are some of those I made up a few weeks ago by pulling up a running stitch I had sewn through one side of sheer ribbon. There are beaded pearls in the centers. I also added three pearls beside the sentiment piece. Grab a cuppa, this is a long read today but I do want to share it all. :-D I have to brag on both my granddaughters today! A couple of weeks ago, I shared with you about my younger granddaughter's Competitive Cheer team taking First Place in their division and her gym program taking overall Grand Champions at the competition held that weekend in our state capital, Sacramento. This week, her team received an unexpected invitation to "The Summit," for the national Cheer championships held in Orlando, Florida, the first weekend in May! As it turns out, each team from her gym which competed throughout the season has now received an invitation to one level or another at the national championships. Some of those invitations are fully pre-paid and others are just the invitation to compete. My granddaughter is on a team which must pay their own way so we're now scrambling around, doing fund raising since that trip will cost about $3,000 for each child (with their chaperone) on the team. Yikes! Makes me wish we lived in Florida instead of California. Or at least had more time to raise the funds. We have barely three weeks before everything has to be paid. 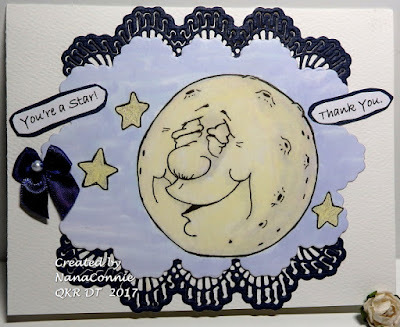 Last week, I posted a card with an image she and I had colored together. I was pretty impressed with what she did because it was really the first time she had worked with colored pencils. Today, I've made a card with an image from Ching-Chou Kuik which she colored entirely by herself. See what I mean about her being an artist? She's fantastic! 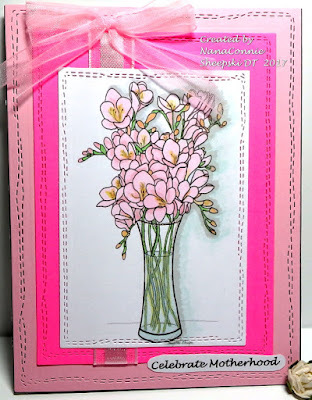 I took her colored image, cut it with a Gina Marie die, and mounted it onto a pink card base. I added sheer polka dot ribbon and bow. The sentiment is computer printed and hand-cut, then matted. The butterfly is double layered (dies from Presscut) and adhered as a complement to the butterflies in the image. 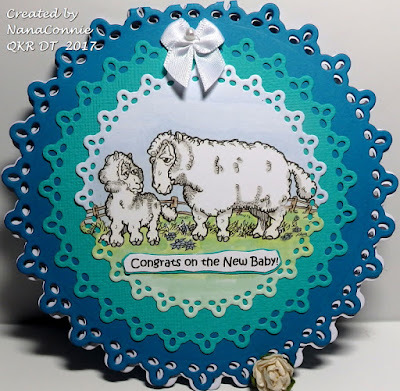 The die cut frame is so elegant and lovely that I let it be the primary embellishment, minimizing the other things to some degree. I combined two QKR images - "Armadillo" & "Baby Armadillo" - but I reversed the Baby Armadillo image so that they would be looking at each other. 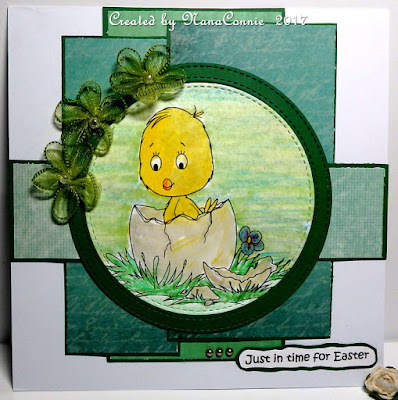 I used ProMarkers to color the images, then die cut them with a Sue Wilson die. 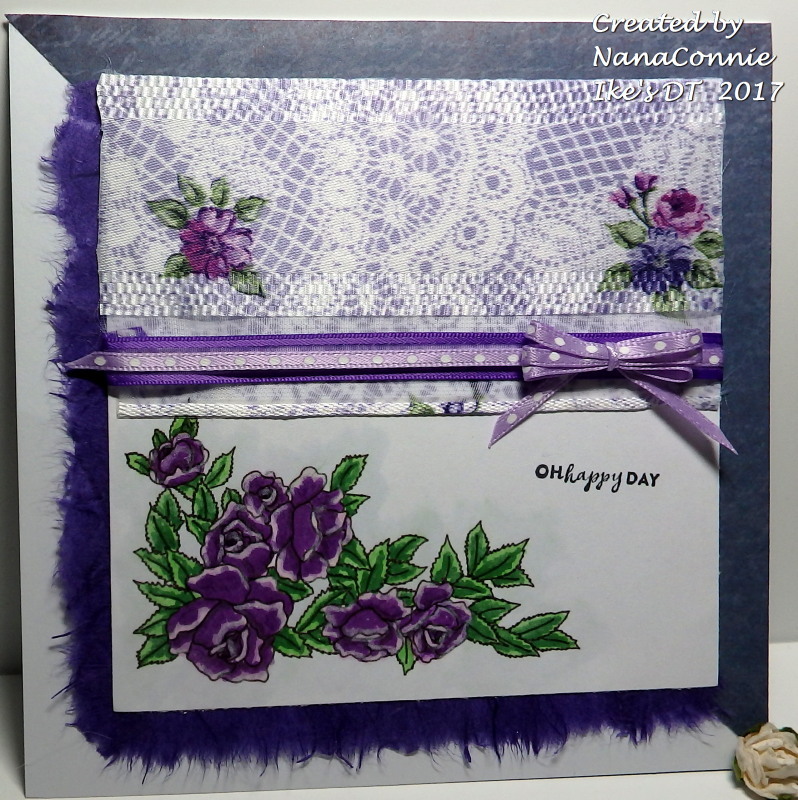 Can you believe that everything on this card was made with items which were in my scrap basket (with the exception of the big bow)? 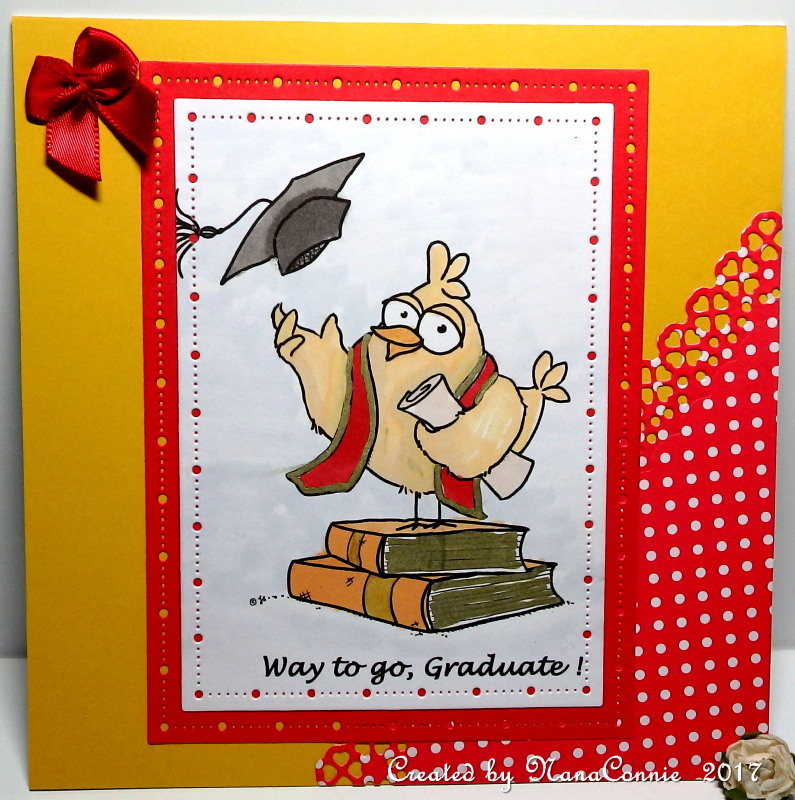 I'm having to do several graduation cards this year. There's a group of ladies at a nearby Senior Center (where I donate many of my cards) who have asked about graduation cards for their grandkids and even twin nephews in one case. I've been trying to find out what the school colors are for each of our middle and high schools in my town but so far, I only know the colors for one school. 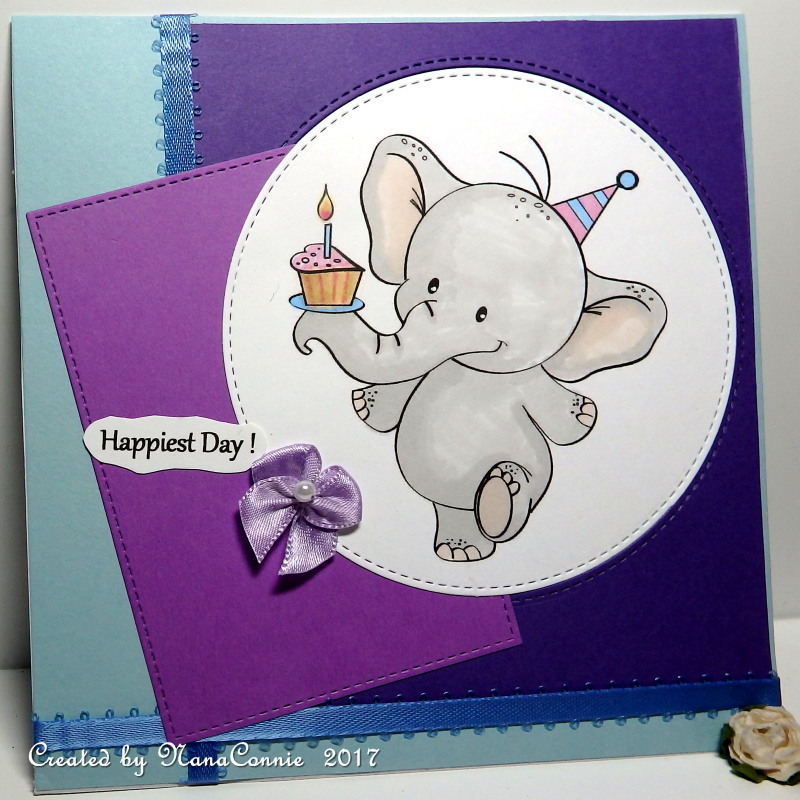 and the image also belongs to From the Heart Stamps. I had forgotten how much I love red and yellow as a color combo on cards but this is definitely a favorite of mine. I colored this image with ProMarkers and a gold paint pen. 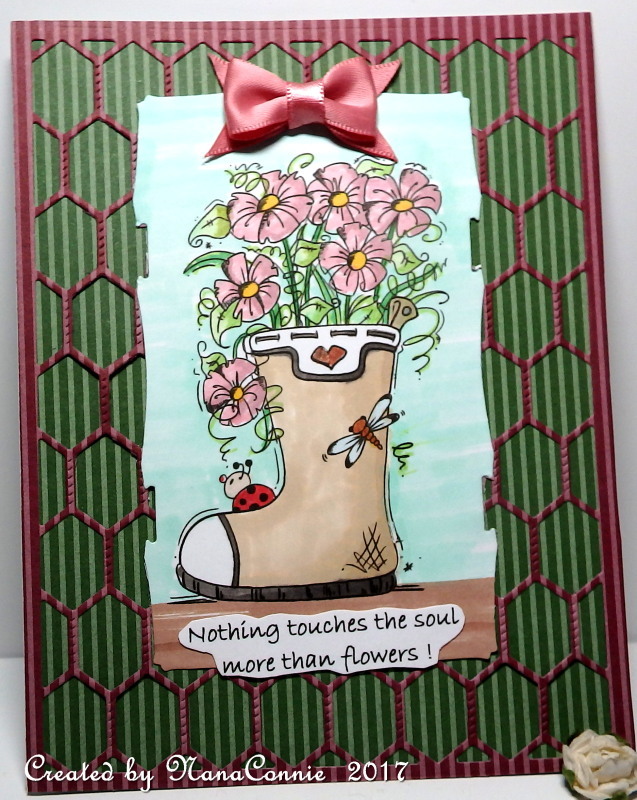 I cut the image and the red mat with my newest die set from Gina Marie. The polka dot triangle was cut with another Gina Marie die, then trimmed to fit the card corner. I added one tiny, red, bow and left it rather CAS. I don't know if this card is going to a girl or a boy so I wanted it to be appropriate for either one. I'm a huge fan of Bugaboo Stamps and I can't even tell you how many I have in my collection but it has to be in the high hundreds. 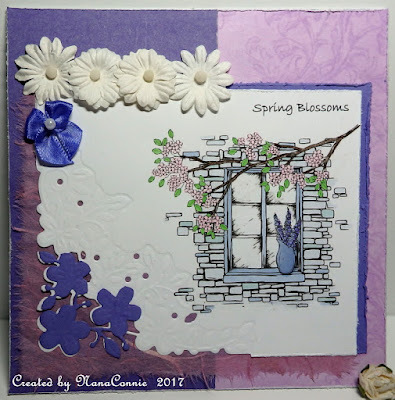 This is one I've never used before making this card but it seems so clearly an image for spring. Despite being sick, I'm so glad it's spring! I know my allergies will kick in soon but I'm not going to let even that get me down. I colored with my ProMarkers, then cut the image with a die from Cheery Lynn. 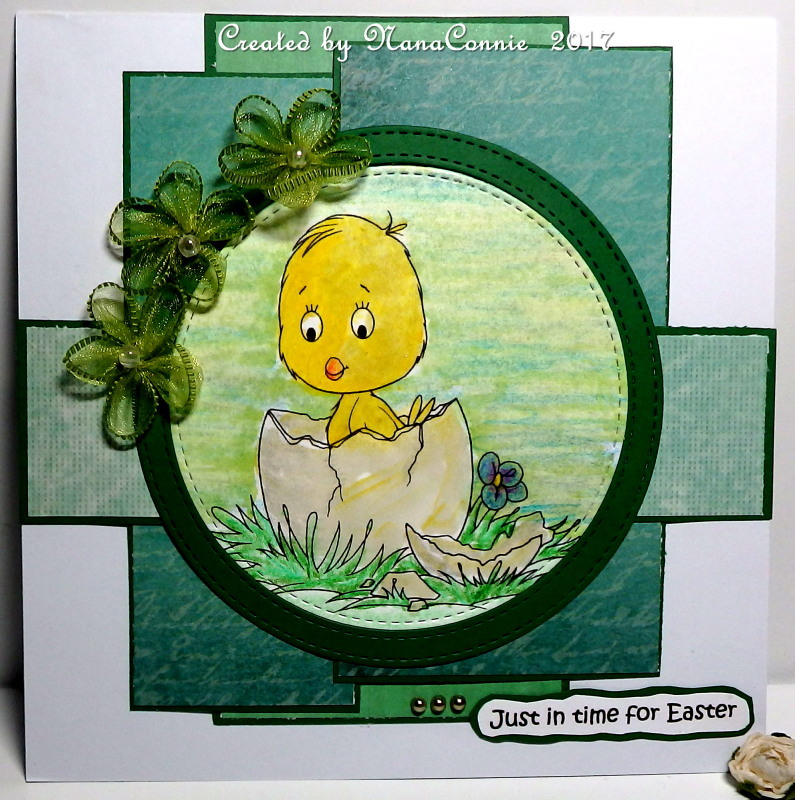 The background "Chicken Wire" die is also by Cheery Lynn. Both of the papers came from SU and the bow is one of the bowties I learned to make as few months ago. I don't normally like finding ants in my spring garden but this one is just too cute to dislike. :-D The image is from Sasayaki Glitter and it's the freebie for their latest Progressive challenge on their Facebook page. 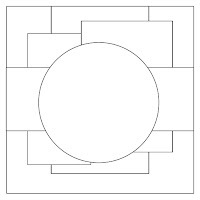 although I took a bit of liberty with the shapes. 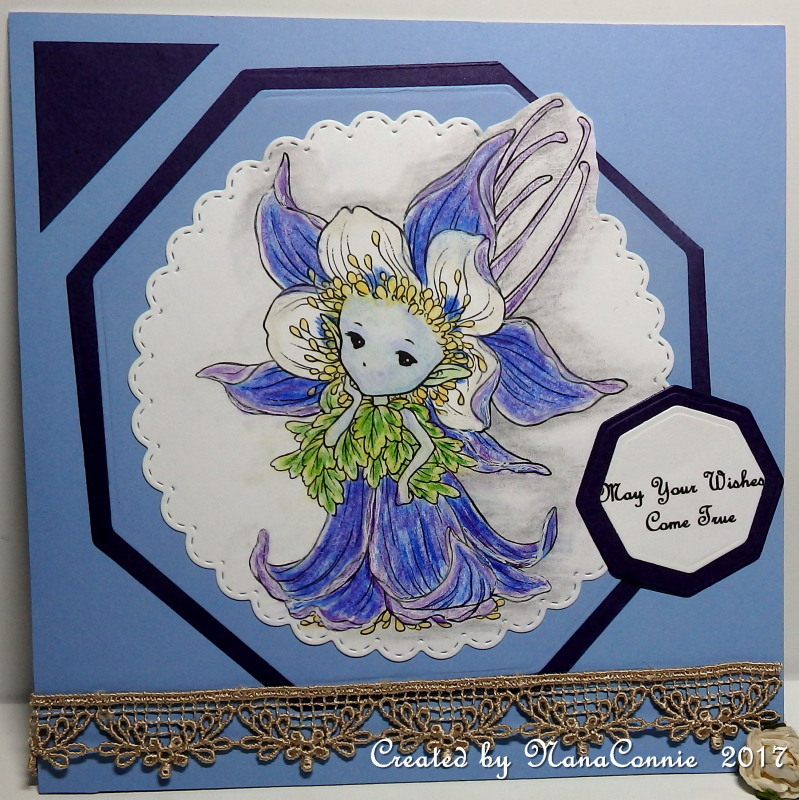 The image is hand colored with ProMarkers and I played around with my newest set of border dies from Spellbinders. I love the amazing shapes I got and the delicate embossing that was possible on each piece. 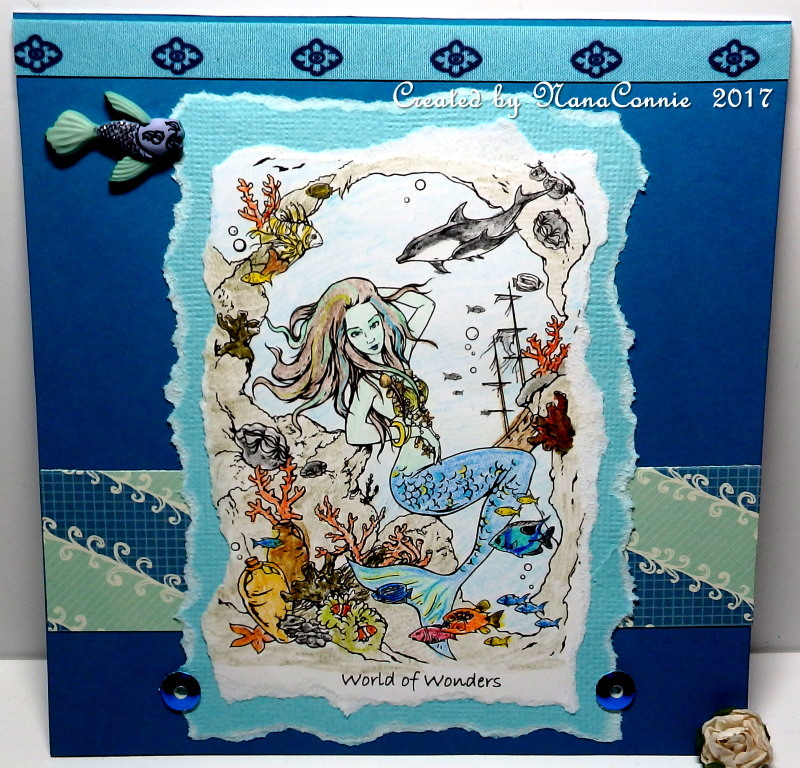 I layered all the pieces onto a kraft card base (which is actually recycled from a cracker box insert!) after I added the ribbon. 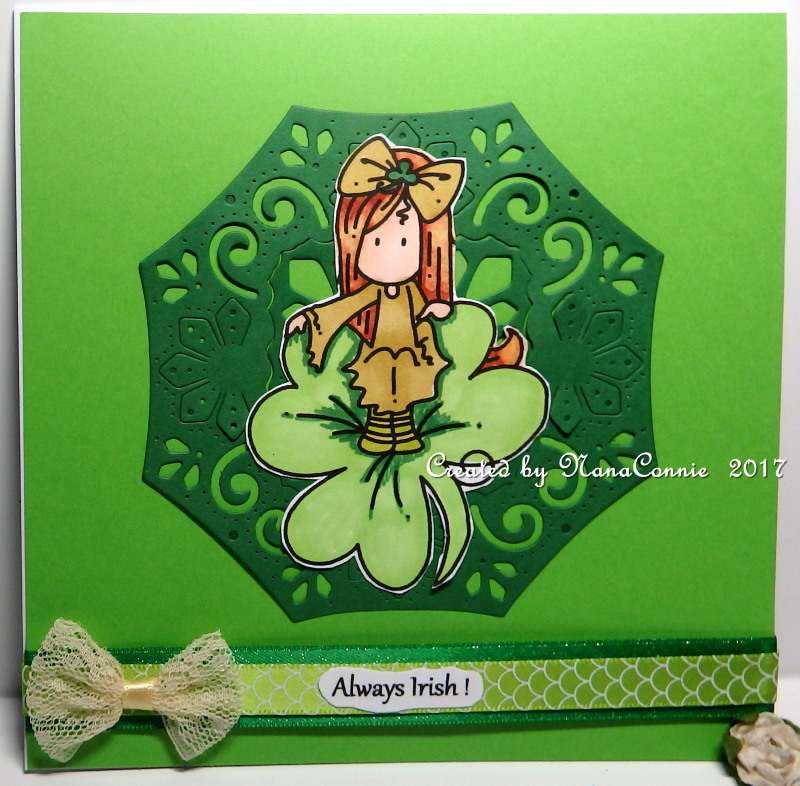 The sentiment was printed and hand cut, and I added a tiny gem to each of the four corners. Complex looking but very simple in design. It's March 20th and our Facebook challenges for Sheepski Designs always begin on the 20th of each month. Our theme is Anything Goes but, for me, this seemed like a good time to get to work on some Mother's Day cards. 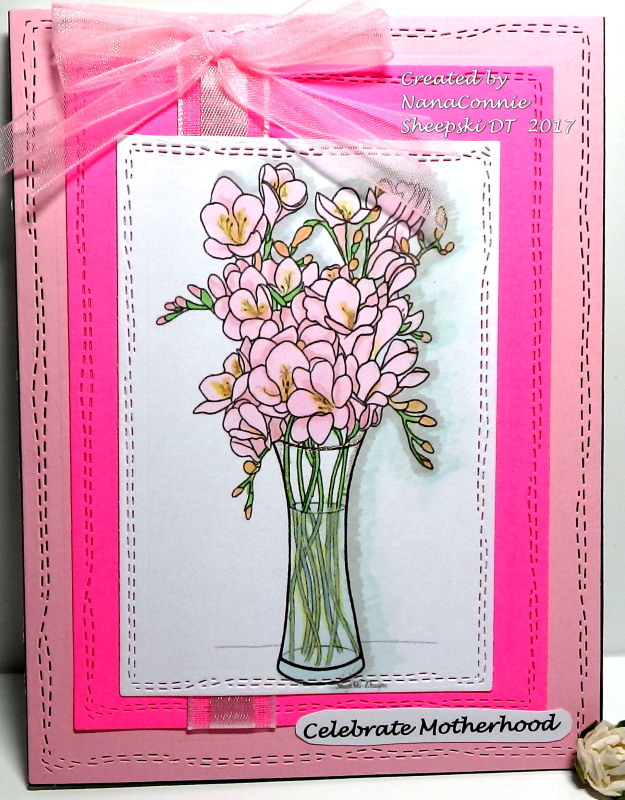 This gorgeous "Freesia" image seemed perfect for a mom. I used a combination of things to color the image this time. Chalks on the flowers, watercolor pencils on the vase, water and stems, and finally, ProMarkers to add the shadow effect on the right side. I used a set of stitched dies from CUTplorations to cut the image and both matting layers. 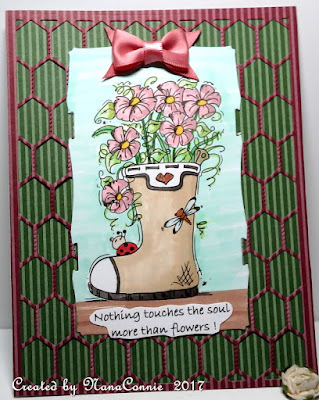 I added ribbon to the darker pink mat, then layered it onto the base layer and put the image on top before adding the hand tied bow. I printed and hand cut the sentiment, and then left it alone. I wanted the image to have center stage and chose not to cover it with embellishments other than the sheer bow. I had a fun couple of coloring days and the best part was sharing them with my eldest granddaughter. She colored a couple of images which you'll see on cards later on and then, on this Mermaid from Fabrika Fantasy, I colored the background and she did the mermaid. It seems our coloring styles are very much alike. Other than knowing which of us did which part, I don't think I'd be able to tell any difference. We were both using polychromos pencils. Rather than using dies to cut the image, this time I did the old tried-and-true tearing on the image and again on the mat. The wide strip is dp from K & Co. and the narrow strip at the top is ribbon from my stash. The fish charm is actually a shank button with the shank removed. Greetings on a wonderful Saturday morning! We've had such beautiful spring weather for the last week and it makes me think of flowers, gardens, butterflies... It seemed like a good weekend to make bright sunshiny cards, including one for Mother's Day - a favorite holiday only now I celebrate them with my daughter, DIL and GDIL since my mom has been gone for many years. 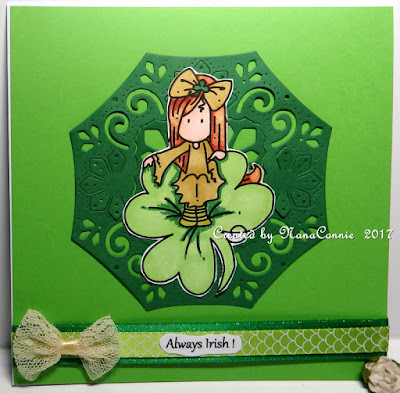 I used ProMarkers to color the image (from Di's Digi Designs) and a die from Amy Designs to frame the image. This is only the second time I've used this relatively new die and I really love how it looks. It's a bit hard to adhere but I used a glue pen and it went fairly quickly. The ribbon is from my stash and the bow is one of those I sew by the dozens and toss in my stash for future use. Again, it was made with white, satin ribbon but I dyed it with a ProMarker. 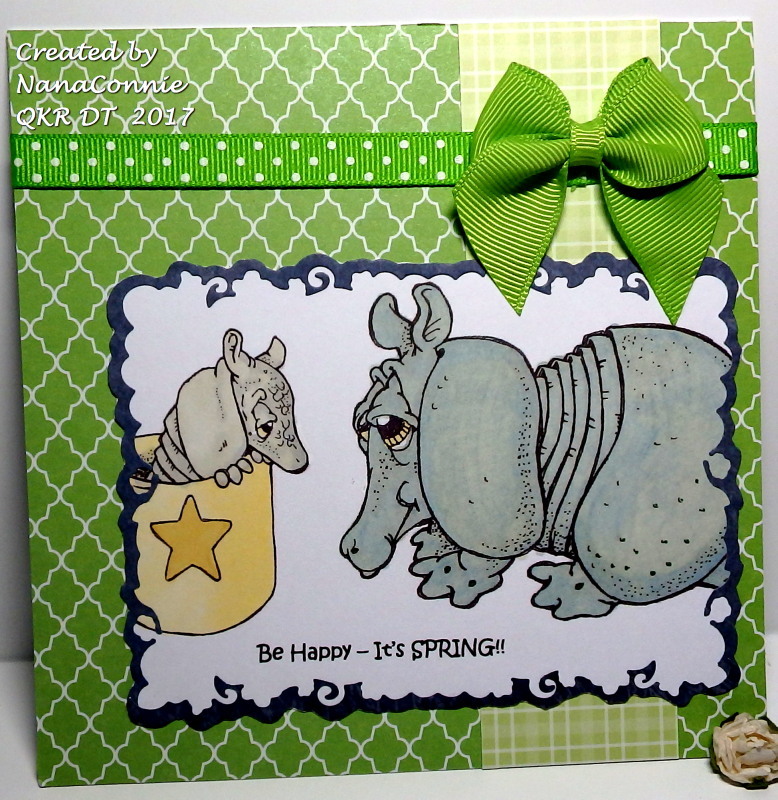 I had so much fun making this card for the new challenge starting today at QKR Stampede. We always have an "Anything Goes" theme but we also toss in an optional twist if you want to use it. This week, we're doing "Congratulations" and I decided that a card for a new baby would be perfect for that twist. I used the QKR Stampede image "Ewe and Lamb." I colored the image with my ProMarkers and then started using dies from a set by QuicKutz. 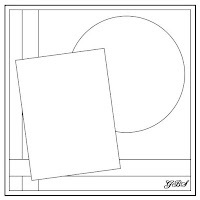 I cut the image, a light blue mat, and a dark blue mat. After cutting all of those, I decided to make a shaped card by cutting white, folded CS for the base. The shape had so much texture and dimension that I thought it would be best to do minimal embellishment so I added one, simple, little bow with a pearl on it. I think this will be my last St. Paddy's card, at least the last one which has to go in the mail. 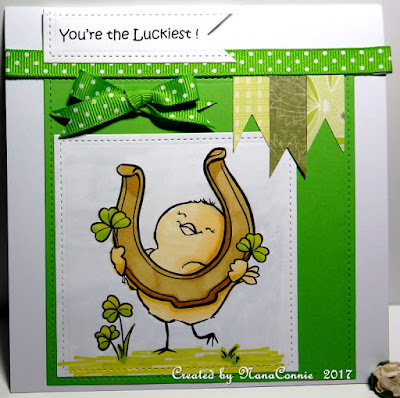 The image is from the progressive challenge at From the Heart Stamps and it was just perfect for one last "Luck of the Irish" salutes. 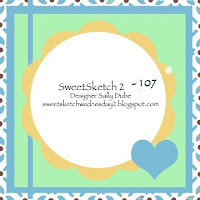 I also used the sketch I found this week at I (heart) Sketches. 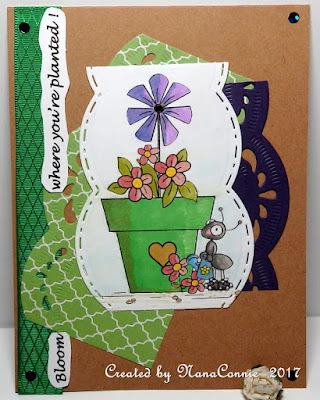 I colored with my ProMarkers and cut with a stitched die from Lawn Fawn. The green CS for the mat is also cut with a Lawn Fawn die. The little dp flags were cut with a die from Spellbinders, and shortened on the back end as needed. I printed the sentiment and used one of the Lawn Fawn dies to cut it, moving the die as needed to get the narrow flag shape, but the dovetail end was cut with scissors. The polka dot ribbon was in my stash and I used the last of it to tie the bow. I love that particular shade of green and have already begun searching online stores to try to find more of it. I'm playing along in another fun, progressive challenge, this time at Dragon's Lair. I guess if you can have Snakes on a Plane, I suppose they must have birthdays to celebrate, too. But how would they blow out the candles on their cakes? 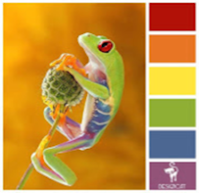 colors from House of Cards. I used Koh-I-Noor pencils to color the image and discovered that they are significantly different from the ones I have been using so I'll have to practice more before I feel really comfortable with them but I do like the 'creaminess' of them. It might also help if I wasn't using them on watercolor paper. The green stripes at the bottom were cut from scraps and the image just fit a plain square die from Spellbinders so I cut it with that die. The ribbon is sparkly and was in my stash. I punched the three flowers out of sparkle CS, put pearls in the centers, and then found the three golden pearls for the upper corner. 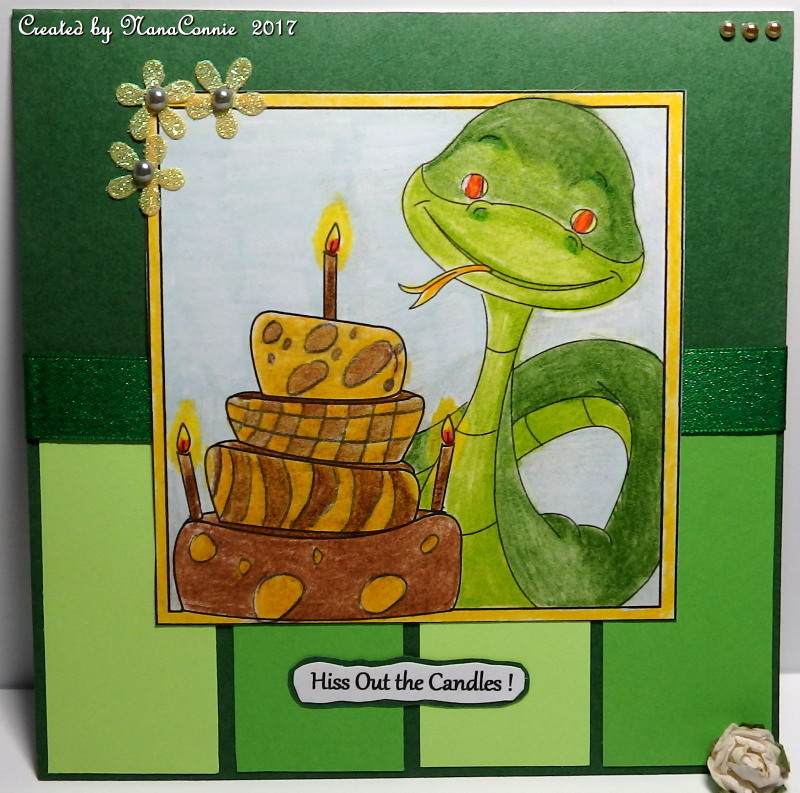 The silly sentiment about "Hiss Out the Candles" is my own, of course. We have a new challenge starting today over at Ike's World. Our theme is our usual "Anything Goes" but our optional twist is "Over the Rainbow" under which we would include Wizard of Oz, music, rainbows, gold, luck. I used my Shin Han markers to color the image, then fussy cut the hat and added it to the image using dimensional dots. I framed the image with a Sue Wilson die cut. The green ribbon was in my stash and the pot of gold was cut with a die from QuicKutz. I added one of my hand-sewn bows which I 'dyed' gold using a Shin Han marker. Well, since nothing was posted over the weekend if you guessed that I took a couple of days off and ran away from home, you'd be correct. I went to my granddaughter's Cheer competition and watched her team take 1st place in their division (Junior Level 3) and, combined with all the teams from her gymnasium program, they took Grand Champions of the entire meet with a total combined score of 97.5 (out of 100) !! Am I excited for them, or what? 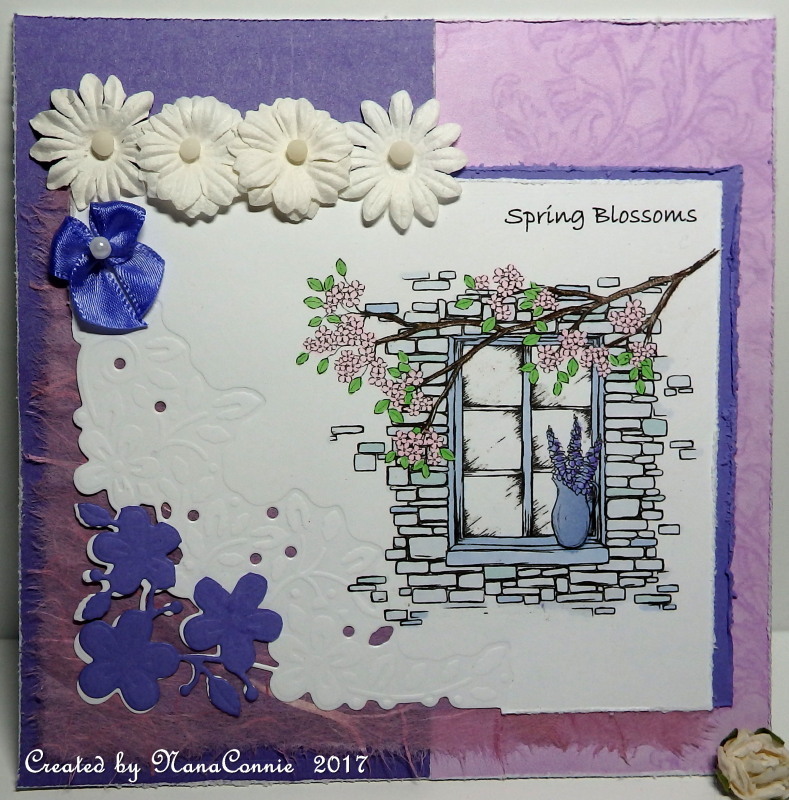 OK, I did manage to make a card very early this morning when I couldn't sleep because of all the excitement and I'll share it with you now. This sweet little image (Columbine Sprite) came from AuroraWings and I colored her with my polychromos pencils. I cut her with a stitched, scalloped die from Die-namics, then framed her with two cuts using dies from QuicKutz. Everything on this card came from scraps, including the piece of white CS on which the image is printed; it was a half-sheet left over from printing another image and I grabbed it, slid it into the printer and saved that from going into the trash. I do love Fridays because I get to play with images from QKR Stampede or Eureka Stamps (sister companies) for our weekly challenge at QKR. Remember, we now have an "Anything Goes" theme every week but we throw in an optional twist if you want to use it. This week the twist is "Thank You" cards. I chose an image I'd not used before, "Full Moon," and I added my own sentiments. I used a combo of ProMarkers and Copics to color this image (thinking about my blogging friend, Lynn, and how much she loves blue! ), then used a Sue Wilson die to cut it. I used other dies from that same set to cut the dark blue frame. Unfortunately, that inlaid frame was the same size as the image piece so I used a new technique - I cut it lengthwise down the middle, spread it apart, and layered the image on top. 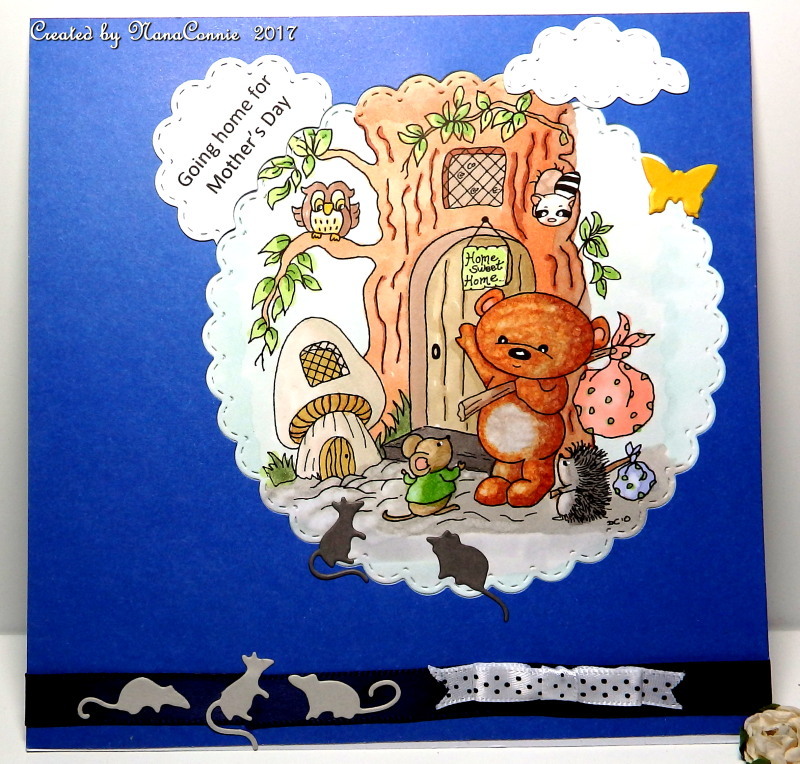 I added the matted sentiment pieces and a small bow (dyed from white to that shade of blue with a ProMarker) and called it finished. This is going to be used for a grammar school secretary on Secretary's Day next month. 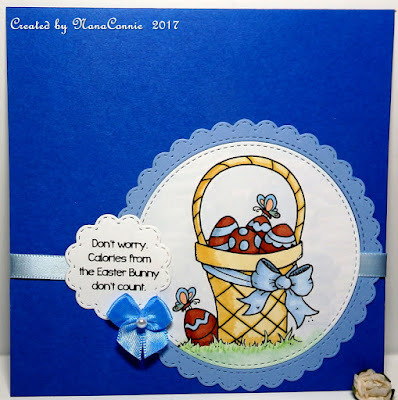 You've all heard the old adage about not putting all your eggs in one basket but this card shows what happens when there's only room for one egg in your basket! :-D The image is for the March Progressive Challenge image at Scrapper's Delights, another of the progressives I play regularly. 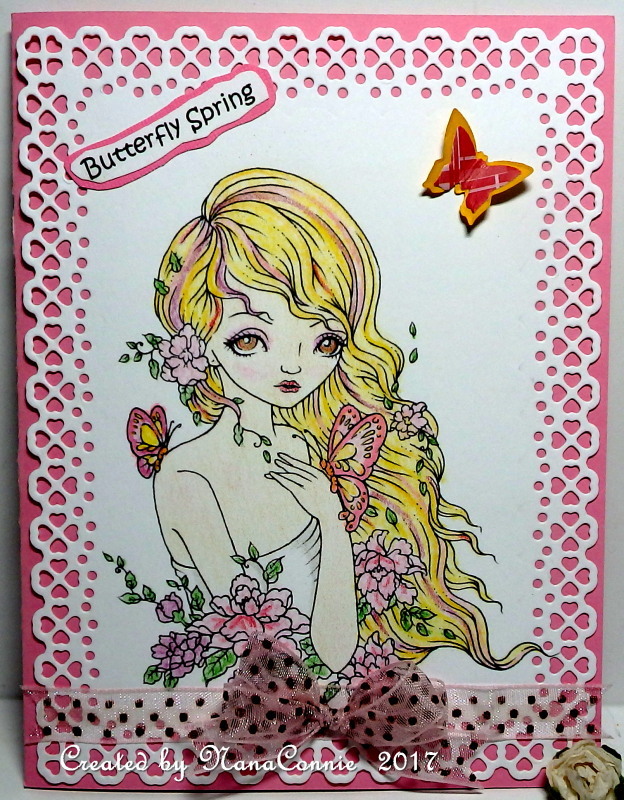 This time I colored it in pastel shades with my Copics and then cut it with a die from Spellbinders. 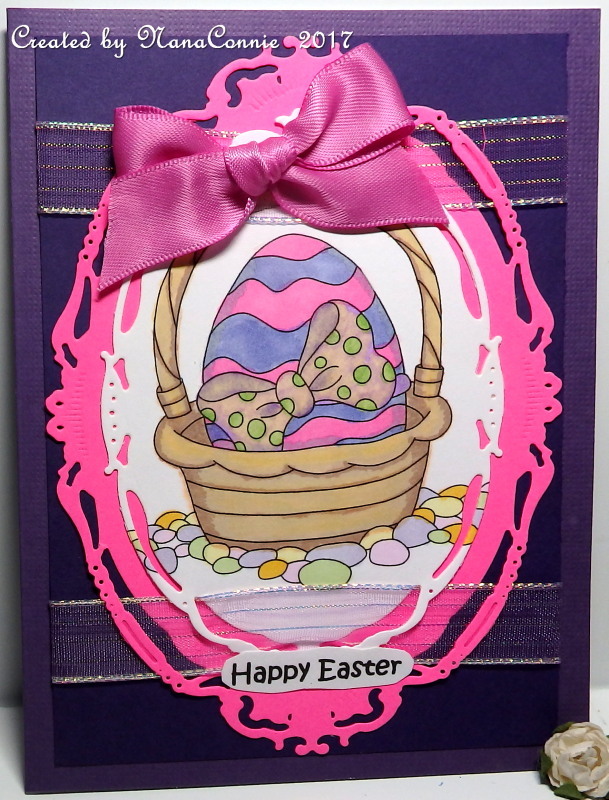 I used a larger die from that same set to cut the bright pink mat. The sparkly ribbon was the last bit in my stash. The pink satin ribbon for the bow was recycled from an old child's dress. 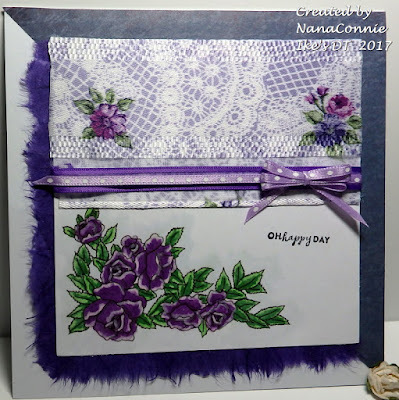 Everything was layered together and adhered to a deep purple rectangle, then added to a pre-made card blank. I found the sketch over at Cheerful Sketches. 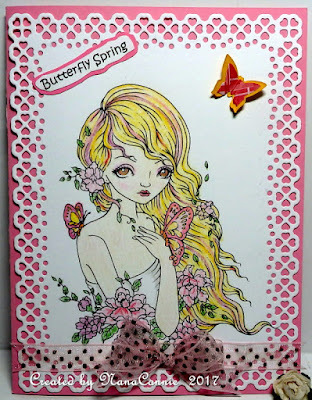 I used a combo of ProMarkers and my polychromos pencils to color this fun image which happens to be the freebie from the Progressive challenge at Sasayaki Glitter. I used stitched dies from Die-namics to cut all the pieces. The blue ribbon was in my stash and the bow is one of those I make by the dozens and toss in my stash for future use. This one was white until I dyed it with a ProMarker. I wanted this to be as CAS as possible, given the layered look of the sketch. and I tried to use the colors as well. 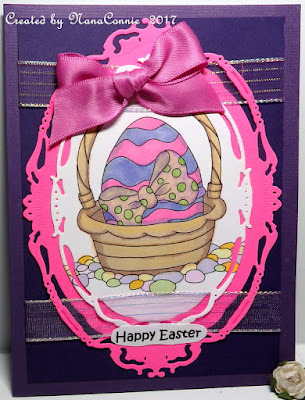 I added just ribbon and the small handmade bow for embellishment and and now I have another Easter card which will be easy to mail. When you have a St. Patrick's birthday, you're always Irish ! In my case, my heritage is Irish on both sides of my family tree so I'm the most Irish member of my American family. :-D I celebrate my birthday by making St. Pat's cards for all my grandkids. I colored the image (Bugaboo Stamps) with my ProMarkers, then fussy cut her. I used dies from Spellbinders to cut the frame and mounted it, with the image, onto a pre-made card base. I added ribbon from my stash and a lace bow and called it finished, a nice CAS design. The magic of Spring is right around the corner and, for those of us who are Irish (and a few who are Irish one day a year! 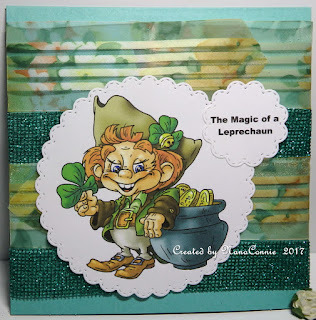 ), the month of March also makes us think of leprechauns, with a magic all their own. 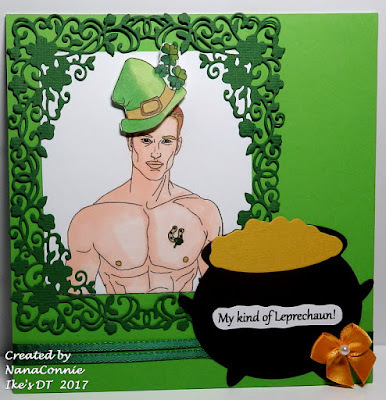 This fun image is from Fabrika Fantasy and, with my Irish heritage, I just had to use this fantastic leprechaun on a card. This is going to be a really fast post and I'll pre-schedule it to go live while I'm sleeping. 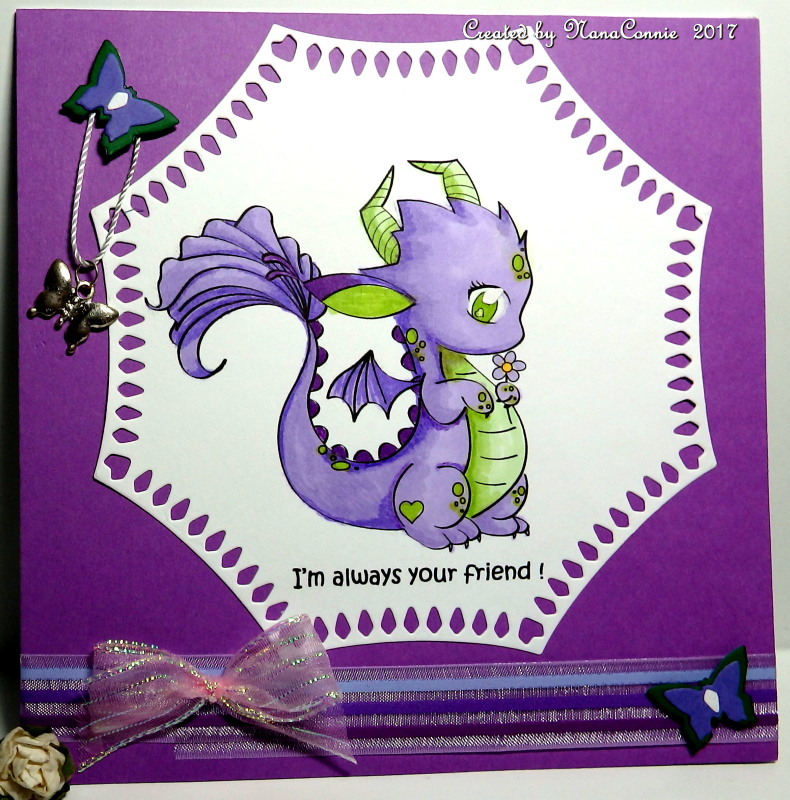 Colored with ProMarkers, cut with a Memory Box stitched, scalloped-circle die, and mounted onto a ribbon background. The dark green ribbon is covered in glitter and sparkles beautifully I used most of that ribbon for Christmas projects. Both of the ribbons were just scrap pieces left in my ribbon box from other projects. The striped ribbon was from a sewing project I did over a year ago. I added no embellishments at all so that it would remain very CAS and easy to mail. I colored him with my ProMarkers and cut him with a die from Spellbinders. The butterflies are cut with dies from QuicKutz and I layered two different sizes to make a double layer butterfly. The white butterfly bodies are made from the bits which dropped out of the Spellbinders' die. The ribbons were in my stash and are from Really Reasonable Ribbon. I found the butterfly charm in my stash and it just seemed to be perfect for this card. Friday has rolled around again and that means another challenge is starting at QKR Stampede. Remember that our challenges are now "Anything Goes" with an optional theme if you want to use it. This week, even our optional theme is "Anything Goes" so how can you lose? You're not required to use an image from QKR but if you do, then your card is entered into a separate draw just for QKR images and your chances of winning are significantly increased! You could also use an image from our sister company, Eureka Stamps, and that would also be placed into the separate draw. I decided it was a perfect week to make an encouragement card for a young man I know. Since he loves Wizard of Oz, this "Lion" image seemed perfect. In the actual image, there's a heart around his neck but I covered that with the "Courage" badge. 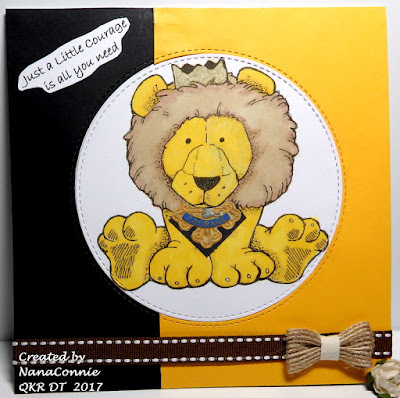 I colored him with my ProMarkers, then die cut both the image and the background CS (both were scraps rescued from the toss-out pile) with stitched dies from Die-namics. I adhered all three pieces to the card front, inlaying the lion image into the background. I found a scrap of the stitched ribbon in my stash and then added one of my wrapped-burlap bows. I thought that made a perfect masculine card for a 10 year old.